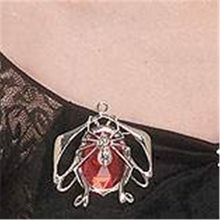 Vampiress Bat Necklace.Includes: One Vampiress Bat Necklace. Available Size: One Size Fits Most Adults and Teens. *Costume and Accessories Not Included. Sold Separately. Complete your vampire costume with this unique Vampiress Bat Necklace! Vampiress Bat Earrings.Includes: One Pair of Vampiress Bat Earrings. Available Size: One Size Fits Most Adults and Teens. *Costume and Accessories Not Included. Sold Separately. 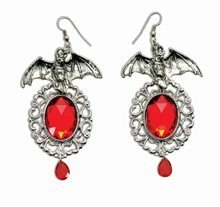 Our Vampiress Bat Earrings offer your fashion from the Dark World costume accessory series. This costume jewelry piece will bring the blood thirsty creature living within you out! Our Vampiress Bat Earrings features a pair of large oval faceted red stones encircled in a silver filigree pendant with a faceted teardrop red stone dangling below. The jeweled pendants dangle from a chain link with a bat charm from pierced ear wires. Our Vampiress Bat Earrings are great for bringing out the Gothic delight of the blood thirsty creature in your Gothic or Victorian vampire costume. Lost Treasure Medallion Necklace.Includes: One lost treasure medallion necklace.Color: Gold & Red.The Lost Treasure Medallion Necklace looks like something found in a buried treasure chest on a deserted island cove. 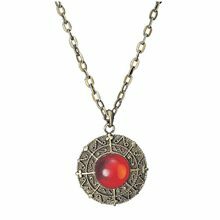 This circular bronze medallion is 2-inches wide and features ancient symbols circling around with a red spherical gem in the center. The bronze medallion hangs on a metal chain to bring you that treasure hunter look. 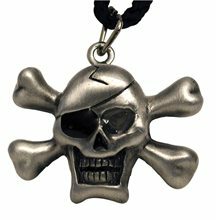 This costume jewelry necklace is ideal accessory for your gothic, vampire, treasure hunter or pirate Halloween costume. Moonlight Fairy Necklace.Includes: One Moonlight Fairy Necklace.Complete your fairy costume with this elegant moonlight fairy necklace! Perfect for any occassion! Black and blue beads.Size: One Size Fits Most Adults. Cross Necklace Gold/Red;Bring a large amount of detail to your costume with our Red Cross Necklace. This costume jewelry piece features a classic cross pendant with a generous filling of hardened crimson red enamel embedded on its facade and hangs from a vintage gold chain. Red is said to bring passion and strength! 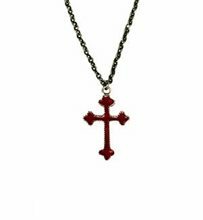 The Red Cross Necklace can be used to display your spiritual belief or as an accessory for your Gothic, medieval, religious or Victorian vampire costume. 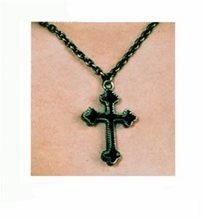 Cross Necklace Gold/Black;Our Black Cross Necklace can add important detail as a costume accessory. This costume jewelry piece features a pretty cross pendant with a generous filling of hardened jet black enamel embedded on its facade and hangs from a vintage style chain. Black is said to be great for grounding negativity and releasing stress. 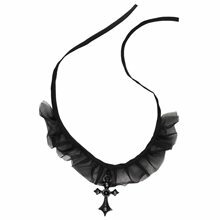 The Black Cross Necklace can be used to show your spiritual belief or as an accessory for your Gothic, medieval, religious or Victorian vampire costume.